People often consume flaxseed meal for health purposes. This substance comes from the seeds of the Linum usitatissimum plant, an annual plant that likely originated in Egypt. Flaxseed also goes by the common name of linseed. Flaxseed meal and linseed meal are the same substance – the only difference is in the name. This type of meal provides a healthy source of nutrients for both humans and livestock. The flax plant has a long history of uses, including the historical use of fibers in the creation of clothing and nets for fishing. This plant provides the material necessary for making linen, a common type of fabric. Flaxseed oil contains an essential fatty acid known as alpha-linolenic acid, or ALA. This fatty acid belongs to the omega-3 group of lipids. Omega-3 fatty acids may help lower your cholesterol, reduce menopausal symptoms and protect against heart disease, according to the University of Maryland Medical Center. This substance may also help in the treatment and prevention of certain cancers, although more research is necessary. Some people add the meal to cereal, smoothies, breads, yogurt, pancakes and other items. The resilient outer coating on whole flax seeds makes them difficult to digest, making them pass through your digestive system undigested. Grinding the seeds helps break apart the hard shell and makes them easier to digest. Flaxseed meal refers to the ground bran, germ and endosperm. Although you can purchase flaxseed meal already ground, you may want to use a coffee grinder to make fresh meal at home. The meal requires refrigeration to prevent the oils from turning rancid. 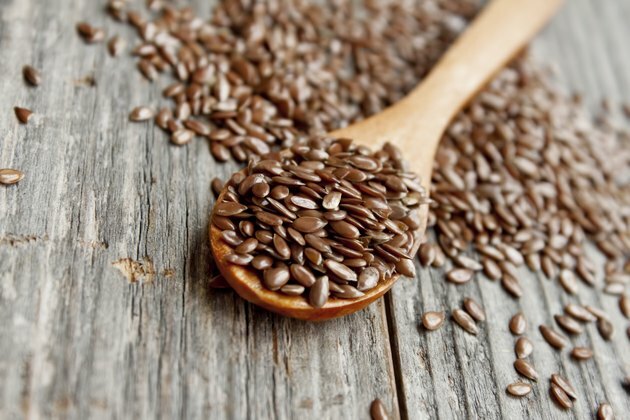 One tablespoon of flaxseed, or linseed, meal contains about 1.6 g of omega-3 fatty acids. The adequate intake of omega-3 fatty acids for adults is between 1.1 and 1.6 g per day, according to the University of Vermont Extension. Flaxseed contains about 40 percent fiber, with 10 percent in the form of soluble fiber and 30 percent in the form of insoluble fiber. This meal also contains protein, potassium and lignans, a substance that may provide anti-carcinogenic benefits. Flaxseed meal supplies a laxative effect, especially in large quantities. This food product may slow the absorption of medications, making it important to discuss your flaxseed use with your doctor. The University of Maryland Medical Center warns against consuming flaxseed products if you have breast cancer, prostate disorders, diabetes or schizophrenia. Avoid consuming industrial linseed oil. Although this product comes from the flax plant, the extraction process may consist of an extraction process that uses a petroleum substance, making it unsuitable for human consumption. North Dakota State University; Flaxseed as Functional Food for People…; Jack Carter, et al.